A couple of trips out in search of a roach this week, and I did manage to find a couple among the gudgeon. Best so far is a fish of about 8oz (bad photo above). I did however loose two, in two casts, both at the net, and both appeared to be well over the pound mark... It'll keep me coming back! 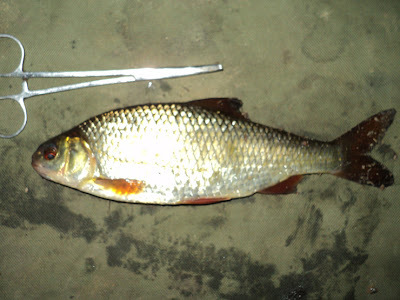 From what I've heard there used to be a good head of big roach in the river, until it was polluted in 2007. Most of the fish stocks are recovering but the roach (and perch) seemed to get hit the hardest. I was chatting to a guy at work who has fished the river a lot longer than me, and before the 2007 pollution incident and apparently dead 4lb Roach were recovered at that time. Not 100% sure of the facts but just shows you that the Roach here definetly do have potential. Keep the quest for the roach up mate....I had an endless stream of them in 2 short sessions today on the river. 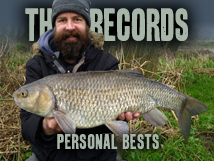 Including a nice brace of 1lb dead on and 1lb 6oz. Bread was the killer bait!